Traditional Italian Chocolate-Dipped Almond Horns recipe – horseshoe-shaped crescent cookies that are moist and chewy on the inside with a crunchy almond texture on the outside. 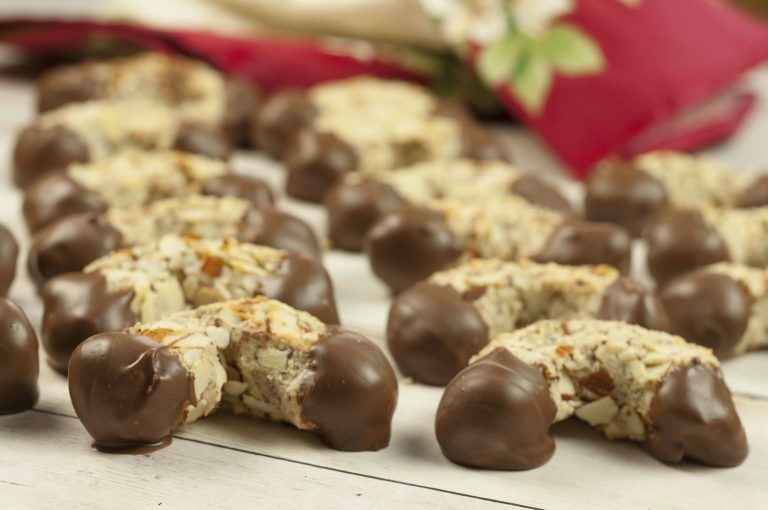 Welcome to your new favorite holiday cookie! I know these bad boys are called “horns” but they are obviously shaped more like horseshoes. You can really shape these Italian Chocolate-Dipped Almond Horns any way you like, but I like to stick with tradition. Everyone recognizes these cookies when they are shaped this way, and what can I say, I am a creature of habit. Everyone counts on me to bring the Italian cookies when I go to holiday parties. Mr. Wishes’ grandmother always made the Italian cookies (she was famous for these Italian Almond Macaroons) for Christmas and I try to keep that tradition going in her memory. They are always the first to disappear at dessert time so I know I’m doing something right. If you’re wondering what else I add to my cookie trays as far as Italian desserts go, these Italian Ricotta Cookies and these Easy Christmas Rum Balls are always present. 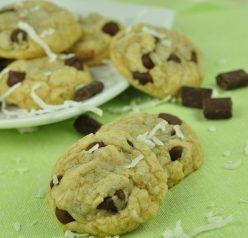 Both cookie recipes are so easy to make. Last year, I also made these Italian Ricotta Peach Cookies for the first time. They turned out just like the cookies we had in Italy when we visited back in the day! The peach cookies were a bit more time consuming as they required more steps, but worth every minute. 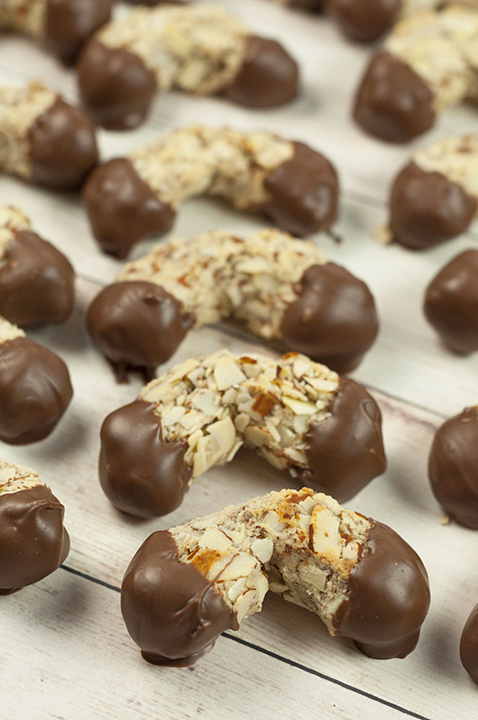 Don’t skip dipping these Italian Chocolate-Dipped Almond Horns in the chocolate – it makes a world of difference! Easy Traditional Italian Chocolate-Dipped Almond Horns recipe - horseshoe-shaped crescent cookies that are moist and chewy on the inside with a crunchy almond texture on the outside. Preheat oven to 375°F. Line your baking sheet with parchment paper or silicone baking mat. In bowl of stand mixer fitted with paddle attachment (or use a hand mixer), mix marzipan, almonds, and sugar on low speed until combined (mixture may appear dry). Mix in egg white and almond extract until well combined. Place sliced almonds in shallow dish and lightly crush with hands. Divide dough into 12 equal portions (about 1 rounded tablespoon each). Roll each ball into crushed almonds as you shape it into approximately 4½-inch ropes with blunt ends. Shape rope into U-shape and place on prepared baking sheet. Continue with remaining balls of dough, evenly spacing them apart on baking sheet. Bake cookies until just beginning to turn golden, about 15 minutes. Let cool on pan about 10 minutes, then transfer to cooling rack to cool completely. In microwave or using the double broiler method, melt half of chocolate, then add remaining chocolate and stir to melt. Immediately dip ends of almond horns in chocolate and place back on parchment paper lined baking sheet. Chill cookies in fridge until set. Serve cookies at room temperature. Enjoy! 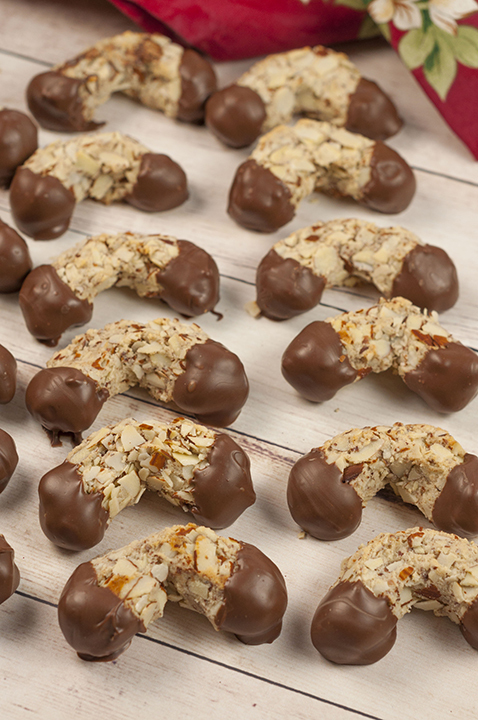 Any cookies (or dessert, for that matter) dipped in chocolate gets an “A” in my book. Dip two ends of a cookie into chocolate? Oh my heavens! Omg, yummy. I would gobble these up SO fast. These are one of my favorite cookies!! I grew up with these in Germany and they’re among my all-time favorite cookies! 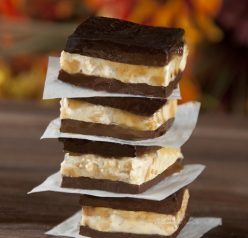 Such an amazing holiday recipe. I love that they are dipped in chocolate. This chocolate-y goodness is a keeper. These almond horns are outstanding!! Perfect for the holidays!! A favorite on any cookie tray! I love these! 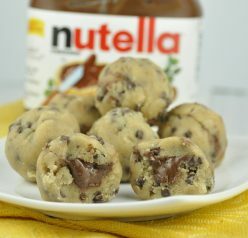 I’m making them for my cookie swap. My kids really enjoyed these! Thanks for the recipe! Pretty holiday cookie for a cookie exchange- always a fave! I haven’t had these cookies in ages, they reminded me of the ones my grandma used to make. Thank you for this recipe.